Our town received a meter of snow in one day. They called it a blizzard, but for us, names didn’t matter. What it meant for us is that roads were closed and houses sat like motionless boats in a shared bay. We were unable to walk to the neighbor’s home without great effort and several stops to rest along the way. Weather is always beyond one’s control and so we decided to embrace it. We were fortunate, with food, warmth and each other. What did it matter if we were stranded together for a few days? 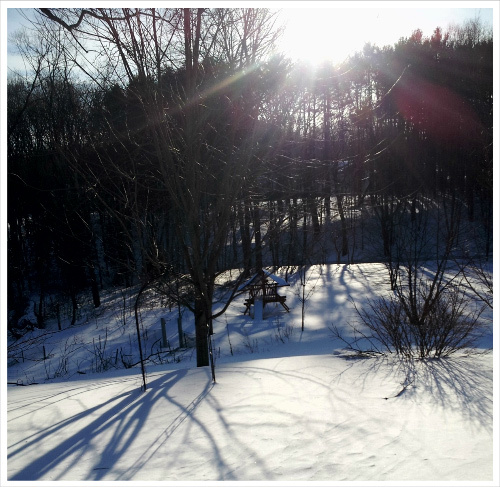 The snow was breathtaking and the world was bathed in a white which accentuated shadows and nuance of color. I made a special breakfast of quiche and homemade bread to make it more of a holiday. Then we layered in snow clothes and walked outside. My husband had removed snow between our house and the road earlier that morning, so the high-walled perimeter of snow-cliffs acted as a giant playpen for Sunboy and Flowergirl while we continued clearing snow. Of course, this rectangle didn’t hold us for long, and we were soon climbing onto the tall snow drifts. Sometimes the adults sank through, and so learned to crawl and roll across the snow. The children were light enough to prance on the surface like frolicking birds. We found ourselves in back of the house looking at a pristine world with swaying grey shadows. I flopped on my back to watch the clear blue sky and lazy wisps of clouds. We stayed outside too long while Sunboy and Flowergirl explored their new world, and we adults found a second childhood. A few days prior, the blizzard had caused panic as everyone stocked food supplies for the great unknown. In our case, the unknown we found was ourselves – our childlike fascination, a rejuvenating beauty and each other. We all became explorers, rediscovering what really mattered. It was a gift. The storm was a blessing in disguise. It’s so easy to be mired in the churning needs of everyday life. Yet, life tends to move forward regardless of whether I offer my stress to the mix. Times like these allow us to poke our head above the clouds and see who we really are. See what really matters. We’re often content to maintain life as it is. We resist change and the unknown, but embracing change can sometimes lead to finding new beauty and a new perspective. There are never-ending schedules, demands and desires, but ultimately, none of it really matters. Being stranded with my husband and young children allowed us to set aside life’s demands for a little while. My family makes life worth living but sometimes gets set aside for more “urgent” concerns. During the days of the snowstorm, we had need of nothing besides each other. This will continue to be true after the snow melts. We are a family on a boat, our boat, enjoying the beauty of the sea and our closeness with each other, regardless of the weather.